London Bed and Breakfast in London - London Bed and Breakfast 'Hotel Barry' in Central London 300m away from Hyde Park. Hotel with 18 rooms, Internet, telephone. We believe in family like care. 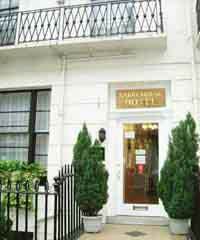 Friendly London bed and breakfast accommodation is located in central London close to Hyde Park, Marble Arch and Oxford Street. Convenient for public transport with Paddington Station just 3 minutes walk away. Barry House Hotel, London has single, double, twin and family rooms, most of the rooms have en suite shower/toilet facilities. Every bedroom also has colour TV with satellite channels, Direct Dial Telephones and tea/coffee facilities. Within Walking distance is the West End and the shoppers paradise of Oxford Street and Bond Street and attractions such as Madame Tussaud's and for the more serious the museums of South Kensington. There are 2 underground stations within 3 minutes walk which provide efficient Subway transport to all parts of London and also Paddington Main Line Station - direct train link to Heathrow airport and train services to the West of England and Wales, places such as Stratford-upon-Avon and Oxford.